Allium schoenoprasum, from the genus Allium (edible onions). 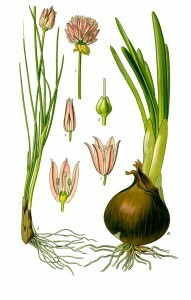 The main difference between chives and green onions is that people have given green onions a variety of names (scallions, spring onions, salad onions, table onions, green shallots, onion sticks, long onions, baby onions, precious onions, yard onions, gibbons, or syboes) whereas people only refer to chives as chives. Also green onions have yellow flowers and don’t appear to have bulbs or leaves whereas chives have bulbs, leaves, and purple flowers. 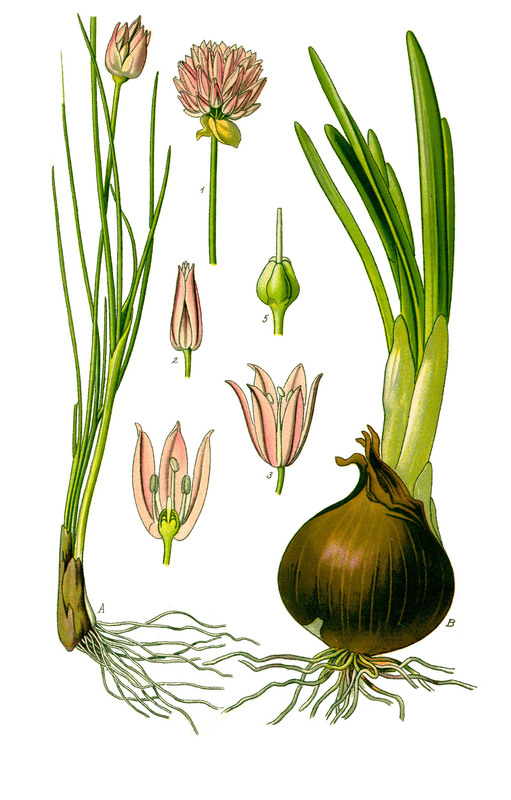 The word “chives” is derived from the Old French “cive” which is in turn derived from the Latin “caepa” for onion (think cebolla). Chives v. chive. Usually plural refers to the singular. But see chives v. chive. Curious results (heavily skewed toward chive) accounted for by popularity of internet kudzu, “thechive.com.” Devastated when I learned that results from chives v. scallions were also skewed for same reason (fueled by desperate searches for non-existant website, “thechives.com”). Decorative chives. But we know them as ornamental onions. Related: Chive makes some pretty nifty vases — strangely though, the vases contain all sorts of exotic flora but not chives. Unsubstantiated rumor of a subdivision with chive lawns. Will continue to search. Wikihow for drying chives. Step 1: Dry chives. Results from chive professors: chief volatile components identified as dipropyl disulfide, methyl pentyl disulfide, pentyl hydrodisulfide and (cis and trans) 3,5-diethyl-1,2,4-trithiolane. Note predominance of sulfur. Editors note: This is the first installment of The Dairy River Unabridged Guide to Goods & Services, using the Trademark Acceptable Identification of Goods & Services as an index. It represents our systematic efforts to examine detritus, ephemera, minutia, and miscellany. Each entry is presented in convolute/monograph form.